germ@namur: What's in a name? The Oval Office! What's in a name? The Oval Office! It shelters one of the most beautiful desks ever designed, it was created in 1909 and since then, it has been the office of the most powerful politician in modern human history. You can see it in many films, where it is sometimes destroyed, it is indeed the best known official room around the world: the Oval Office. Originally, the President's working office was situated in the main part of the White House: the Executive Residence. In 1902, this office was moved to the West Wing in order to allow the President to be involved in the day-to-day administration of his presidency. 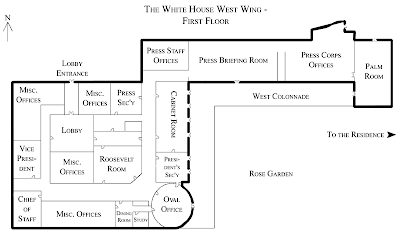 Thus, his office (still rectangular in 1902) was arranged in the middle of the building and surrounded by the secretaries’ offices (the President’s senior staff). In 1909, President W. H. Taft intended his office to become the center of his presidency by transforming it into an oval office, inspired by the elliptical Blue Room situated in the Executive Residence. Consequently the architect Nathan C. Wyeth was asked to reshape the President's office in order to transform it into the nerve center of his administration where he could work and have official meetings. 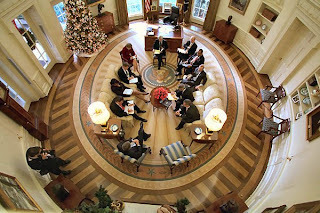 The Oval Office hasn't dramatically changed since then; it features three south-oriented large windows behind the President's desk, a fireplace at the north end, the official carpet covering the entire surface and bearing the Seal of the President and finally four doors connecting the Oval Office with important rooms of the West Wing (the President's private study and the office of the president's secretary), but also with its corridor and garden. However, the President's desk didn't please all the presidents. 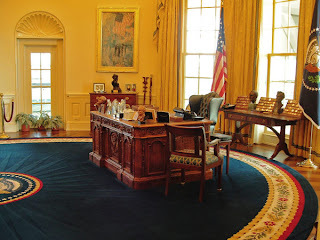 Five different desks have been brought into the Oval Office, one of them being the well-known Resolute Desk, used by presidents Kennedy, Carter, Reagan, Clinton and W. Bush. 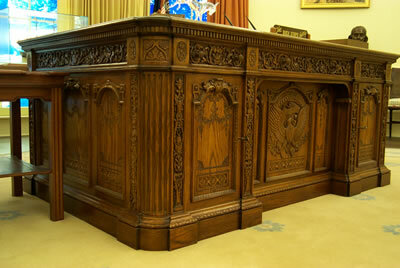 This desk was a present from Queen Victoria in 1880 and was made from the timbers of the British boat HMS Resolute. Since the latter part of the twentieth century it has been a tradition to redecorate the office to the newly arrived President’s liking. Each administration usually selects a new drapery, the paintings of the wall and some furniture (mostly paintings and sculptures) are chosen in accordance with the First Lady's taste! Clinton's office was very different from that of Bush, the former using light colours (cream and gold) and the latter more sombre colours (ranging from green to purple). The Oval Office has often been associated with the presidency itself (Kennedy's son playing in the Resolute Desk or Nixon speaking with the Apollo 11 astronauts) or used for official television broadcasts (for the Cuban missile crisis and the events of 9/11). Moreover it is also said that Crosby, Stills and Nash fired up a joint in the Office when performing for President Carter in 1977. The popular television show 'The West Wing', broadcast from 1999 to 2006 on NBC, unveils the mystery and secret around the most famous office in the world: The Oval Office.